MISSION, KS--(Marketwired - Jun 19, 2015) - (Family Features) When remodeling your kitchen, it can be tricky to know where to start. Certified Kitchen Designer MaryJo Camp has been there, in more ways than one. As a designer certified by the National Kitchen and Bath Association (NKBA), Camp has designed thousands of kitchens in her 35-year career -- including her own. With a newfound personal understanding of remodeling challenges, Camp has pulled together her top tips for a successful kitchen revamp. As you start to look for kitchen designers and contractors, ask for references from their last few jobs and call those references to ask about the experience. Ask specific questions: How did they leave the jobsite? Are they loud? Did they show up too early? If sticking to a budget is critical, yet a reference says, "Well, he came in way over budget, but he did such an amazing job," this isn't the guy for you. You may find yourself gravitating toward a kitchen style that will look foreign in your current house. By adding unexpected elements, you can incorporate more contemporary finishes in a traditional space, or vice versa, without completely disconnecting from the house style. Look for brands like Neolith, www.neolith.com, that offer a multitude of style options for the larger surface areas of your kitchen -- including flooring, wall surfaces and countertops -- with tried-and-true designs that mimic looks of marble or granite, as well as more modern options in blue, green, black and much more. Remodeling because you're tight on space? You're not alone. "The top complaints I hear -- no room for seating, too little counter area -- all go back to a lack of space," said Camp. "We borrowed space from a closet in our entryway, which only added about 20 square feet, but it made a big difference." When you're ready to choose materials and finishes, it's easy to get overwhelmed. Keep in mind that practicality is key, especially when it comes to countertops. Softer stones like marble are beautiful, but also very delicate and require special care. If you're looking for a material that gives the look of a natural stone, but can stand up to anything, consider an all-natural sintered compact surface. "Personally, I cook often, I'm a little clumsy with red wine, and I'm not religious about using a trivet before putting hot pots down," said Camp. "For me, a Neolith countertop with incredible resistance to scratching, staining and heat, was the most stylish and practical choice." "Everyone always wants to talk about what they hate about their kitchen, but people rarely consider what they love about the existing space," said Camp. "Whether it's liking how the light comes in or your kids' favorite homework spot, you don't want to take that away." With these tips in mind, you're well on your way to a smooth-sailing kitchen remodel. 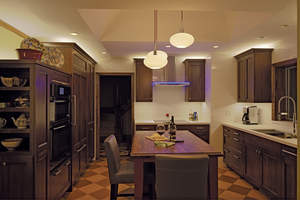 To find an NKBA-certified kitchen designer near you, visit www.nkba.org.